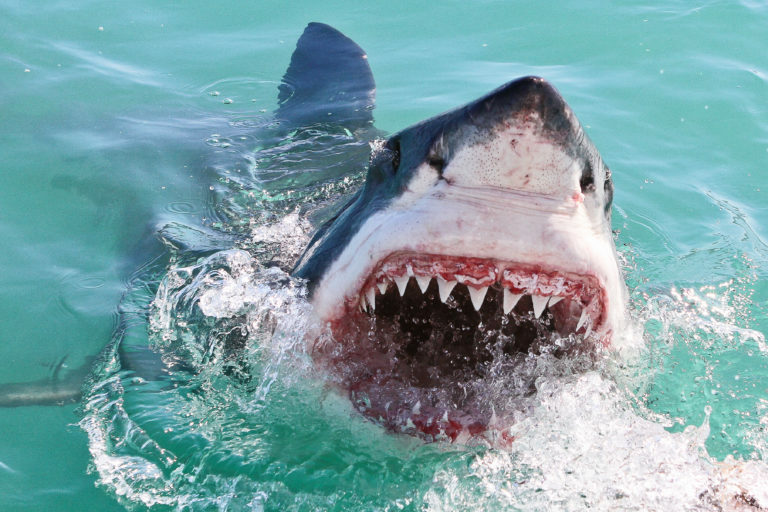 The great white shark is a ‘man-eating monster’. The legendary great white shark is far more fearsome in our imaginations than in reality. Although they are sometimes portrayed as man-eaters, these animals are responsible for just five to ten attacks a year on average. According to statistics, humans are more likely to be killed by mosquitoes, dogs, cows or even ladders than in a shark attack. Most great white attacks are fatal. Most of these attacks are not fatal, and research has shown that great whites, who are naturally inquisitive by nature, are “sample biting” then releasing their victims rather than preying on humans. They use their teeth in somewhat the same way as humans use their hands – to gather information through touch. All great whites look and act the same. In actual fact, great whites can look distinctly different to those with a trained eye. Their dorsal fins are particularly distinctive, with unique ridges and marking that allow scientists to tell them apart. 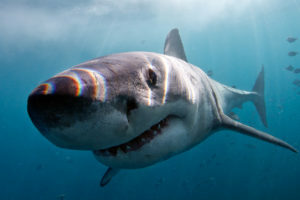 White Shark Diving Company contributes to a monitoring and building a database of the Great White Shark population in Gansbaai using dorsal fin identification techniques developed by Dr Sara Andreotti, a leading shark scientist working with the University of Stellenbosch. We will ultimately use this data for a comparative study to get a clearer idea of exact numbers of sharks left along our coastline. Great white sharks also exhibit a spectrum of behaviour that indicates differences in personality types. Despite recent calls in some parts of the world for increased shark culling and drumline use, most scientists and conservationists agree that these are a destructive and inefficient way of protecting humans from shark attacks. Several studies have shown evidence that these measures do nothing to decrease the incidence of shark attacks and prove fatal to copious other ocean creatures in the process. Quint told us in Jaws that great whites have black lifeless eyes, like a doll’s eyes. This is not true – on closer inspection, you can see that great white sharks have beautiful blue irises. When visibility is good enough and a shark is swimming by slowly, it is possible to see the eye moving when he/she is looking at you.